You can mount a rollfilm back designed for a Graflok back to a 2 X 3 Graphic with spring ("Graphic") back. The shape of the surface on the rollfilm back that mates with the back of the camera is the same as the shape of a cut film holder. Find a "spring kit" originally made by Graflex to do this. It includes two replacements for the springs that hold the groundglass back in place, two screws, and two washers. The replacement springs have ends that are shaped so they press on the edges of a roll holder and keep it in place. I have one of these, and it has three disadvantages. The first, it will not work with very late "Singer" generation roll holders--there are bits that get in the way on these. It will work with slightly older lever wind holders, though. The second, I have seen these advertised for $79, which is outrageous for two springs, two screws, and two washers, third, interchanging the ground glass back and the roll film back isn't something you want to do very often. You definitely cannot just swap them back and forth. Kluge up something with washers to hold the roll back in place, as someone else suggested. Do an even more elaborate kluge, as I used for a while, that allows interchanging the RFH and the GG. get some extra little brass washers, a couple of pieces of flat spring steel about 1/4" by 2", a couple of tension springs about 2" long, and a couple of paper clips. drill holes in one end of each piece of spring steel that the screws that hold the springs for the GG back will fit through. remove the screws holding the springs and the GG back on. detach the original springs from the Gg back and store them. make sure there is a washer in place on the back of the camera where the screws for the springs go in. on top of that washer, put the hole in the end of one piece of spring steel, on top of that put another washer, then the loop at one end of one of the tension springs, then another washer. Put the screw back in, holding this stack in place. Repeat for the other GG spring screw. Now, to use it. To hold the GG back in place, put it on, then rotate the pieces of spring steel, holding them carefully so they don't scrape up the leather or paint on the GG back, around so they extend partly over the GG back and hold it in place. 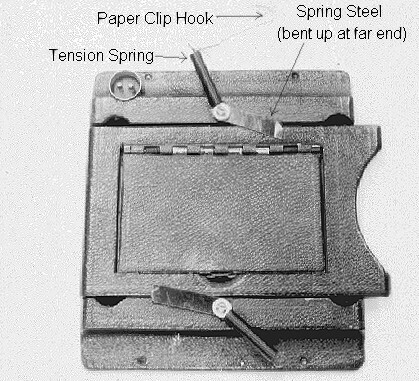 To hold the roll film holder in place, rotate the pieces of spring steel out of the way, remove the GG back, put the RFH in place, pull the tension springs up and over it, and use hooks made from the paper clips to attach the ends of the springs together over the center of the back of the RFH. If the above is unclear, sorry, but I tried my best. It would be worth doing this cautiously, particularly when it comes to putting tension on the screws. The screws in the two cameras I have done this with, one Miniature Speed and one very early Pacemaker Speed, were set into metal fittings and could handle the tension. If yours are screwed directly into wood, I wouldn't try it. The above works, but is esthetically not so hot. A better thing to do is to find a Tatro Adapt-A-Roll 620 roll film holder in the 2 X 3 size. They were made for 620 film, but will feed from 120 spools (you need a 620 spool for takeup, but if you do yourown processing, anyway, you can find a couple of these and keep recycling them). The Adapt-A-Roll has a narrow bit shaped like a cut film holder that will slide in under the groundglass of a spring back, and has both thefeed and takeup spools in a bulgy bit that hangs out at the right hand side. It does allow using roll film with a spring back without the kluges mentioned above. Brought to you by Graflex.Org.